A strong cyclone has slammed into Fiji's northern islands, battering buildings and crops and causing thousands of people to flee their homes, officials say. Cyclone Tomas also killed one person, but the storm is only likely to sideswipe the main islands of the South Pacific country. Tropical Cyclone Center's senior forecaster Matt Boterhoven announced Monday that the cyclone will sideswipe the main islands of Vanua Levu and Viti Levu as it heads northeast, Press TV reported. According to The Associated Press, cyclone Tomas packed winds of up to 130 miles (205 kilometers) per hour at its center, with gusts of up to 175 mph (280 kph), Dobui said. The Category 4 storm was the same strength as Fiji's devastating Hurricane Bebe in 1972, which caused widespread damage and claimed 180 lives. Fiji Tropical Cyclone Center senior forecaster Matt Boterhoven said Monday evening that while the outer islands were expected to be hit in the next 12-18 hours, the cyclone will sideswipe the main islands of Vanua Levu and Viti Levu as it heads northeast. 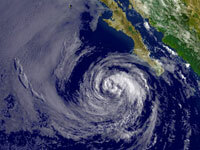 Smaller islands would be hit by gale and storm-force winds, heavy rains and seas. He said villagers can expect "a lot of damage from storm tides." Nadi Weather Office Director, Rajendra Prasad said the full brunt of Hurricane Tomas has been felt in Cikobia for the last few hours and it is a major concern that Tomas is very slow moving and battering the island with hurricane force winds. He confirms that Tomas is now heading towards Rabi, Kioa and Taveuni. A hurricane warning remains in force for the Eastern half of Vanua Levu, Cikobia, Taveuni, Rabi, Kioa, Yacata, Koro, Vanua Balavu, Gau, Batiki, Nairai, Wakaya, Makogai, Cicia, Lakeba, Kabara, Moala, Matuku, Totoya and nearby smaller islands. A storm warning is in force for the rest of Vanua Levu, Ovalau and nearby smaller islands, Fijivillage reports.